It seems that things at SFARDS are progressing well as the company has just released some documents including a datasheet for their upcoming SF3301 Bitcoin and Litecoin dual-mining ASIC chips. 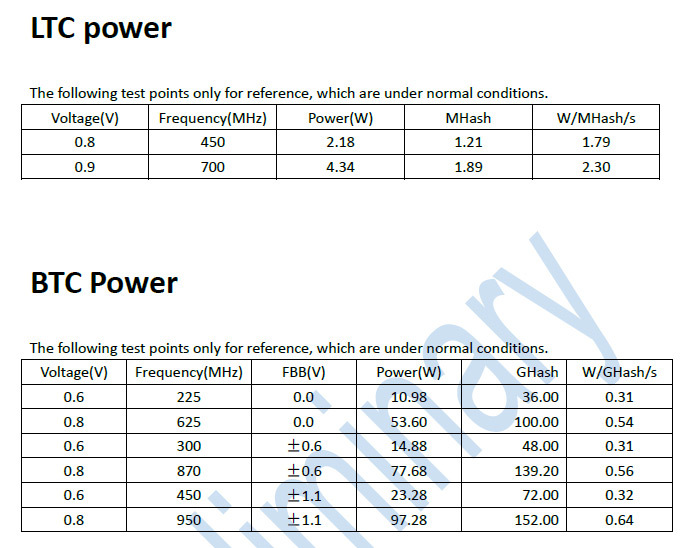 The documents include a preliminary power usage report on expected power usage in LTC and BTC mining modes that you can see on the image above. The numbers released in the above tables are higher than what we have anticipated based on previously released information about performance and power usage as the power efficiency numbers were apparently for too low operating voltages and frequencies that are going to be producing too low hashrates to be useable. Also it seems that SFARDS already has some sample chips and will announce pricing details on May 4th as was announced on their official Twitter account. Based on the official specifications of the SF3301 Dual-Miner chip we are now looking at 100 GHS BTC and 1.75 MHS LTC mining performance per chip with expected power usage of just about 35W. And if we want to overclock it to get about 150 GHS with 3 MHS hashrates it would scale up to about 100W of power usage. Do note that these numbers and specifications are preliminary and are on per chip basis. If we make a 10-chip miner it could turn out to offer 1 THS Bitcoin hashrate and 17.5 MHS Litecoin combined hashrate with a power usage of about 350W which sounds like a pretty reasonable number. However overclocking this to get 1.5 THS and 30 MHS would scale the used power about 3 times all the way up to about 1 KW. So in the end it is going to be all about finding the best balance between hashrate provided and power usage with the maximum performance with overclock definitely not going to be the best option here, but then again the price of the hardware is also going to play a very important role here. People are already placing high hopes on the SF3301 ASIC chips to revive the interest in Litecoin and bring the price to a higher levels as mining for LTC resumes with a more up to date mining hardware that has better power efficiency.